This is pretty incredible. Incredible enough to overcome the language barrier. Here’s the google translate version of the Italian blurb that goes with this video. 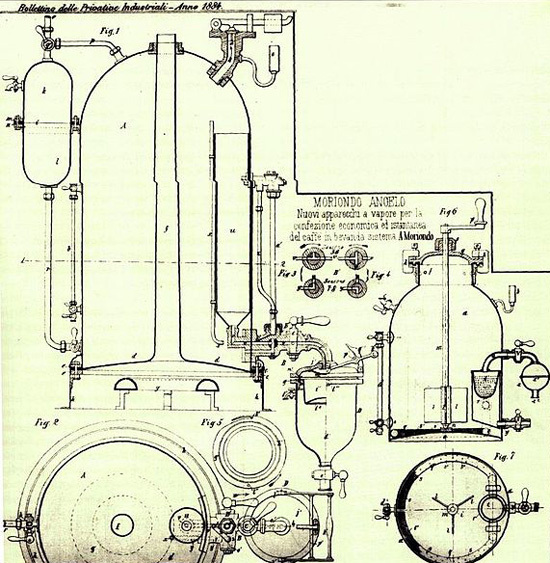 This is a pretty fun, and informative little history of the espresso machine, from the very first patent. On Friday the crema of the crop (see what I did there – it’s a coffee pun) of Brisbane’s microfoam loving, tulip pouring, jug swirling, baristas rocked up at Veneziano’s First Pour cafe in West End for what my friend Mitch described as “the coolest sub-culture meeting ever.” The $400 in prize money, but more importantly the chance for acclaim from one’s peers, was enough of a draw to attract 47 competitors for a string of head to head latte art elimination battles. Those people brought their people, and Veneziano’s First Pour was packed with coffee lovers. The hosts pulled out all the stops, with a sausage sizzle, free beer (though that went pretty quickly), and coffee from their brew bar. Three judges – Queensland Latte Art Champion Scott Luengen, Tim Adams from Tim Adams Specialty Coffee on the Sunshine Coast, and Veneziano’s John-Paul Sutton – scored pourers on contrast, symmetry, and difficulty. It was a fun night, with some amazing pieces of art produced. Here are some highlights from my phone camera – which struggled a little with the lack of light. Mike Tam and Josh Russell Cup Specialty Coffee ended up going head to head in the Grand Final. Here are their last few rounds, and the final itself, in video form. I shot and edited this video on my phone – and uploaded it – the sound goes a bit funny when it switches from video to photos. But you can handle that. In all, it was a really fun night, with a great vibe. Coffee industry peeps are the coolest, I’m always struck by how friendly people who could view themselves as competitors are with one another, there’s a real sense of camaraderie, and wanting to see the industry move and develop through cooperation – which can only benefit us end users. Cup is one of my favourite cafes. It was one of the first places I reviewed here, and it remains in my top three cafes in Brisbane. It has been far too long since I’ve last enjoyed the fruits of their Slayer. And I feel like I should go back there even if it’s just to update the photos used in that review… But we can all enjoy the fruits of their labours together – thanks to their freshly published guide to making coffee which they’ve launched into cyberspace. This is top shelf stuff. Apparently its the material used in their barista course, and apparently there’s an advanced guide in the pipeline – at least that’s what the link says. Splitting milk for multiple drinks should be done immediately after steaming. Pouring multiple drinks from one jug will result in the first drink having more foam. Milk is best served around 60 degrees celsius. You should learn to feel this temperature with experience. Splitting milk into a cold jug will reduce temperature by around 5 degrees. Always preheat jugs before splitting. Like I said in my review. These guys pay attention to detail. They sweat the small stuff – you can see it in the typography in this guide, and you can taste it in the cup. I brewed up a Chemex using some delicious Brazilian “Toffee” Cerrado coffee from Ministry Grounds, roasted by yours truly. I’m playing with a fun brewing app called Bloom, so I know that this particular chemex had 40gm of coarse coffee, which I bloomed for a minute, with 60gm of water, and brewed with a 2:34 pour. I added about three quarters of a tin of condensed milk, and a few dollops of cream to this mix. And stirred. I poured this concoction into the moulds. Then added a dessert spoonful of condensed milk to each. Which sank to the bottom. The lids went on, and these bad boys went into the freezer. And then I ate them. Though the tips didn’t come out of the moulds particularly cleanly. They were quite delicious. And I highly recommend making them yourself. I had some left over mixture, which I drank. It was silky smooth and ridiculously sweet. 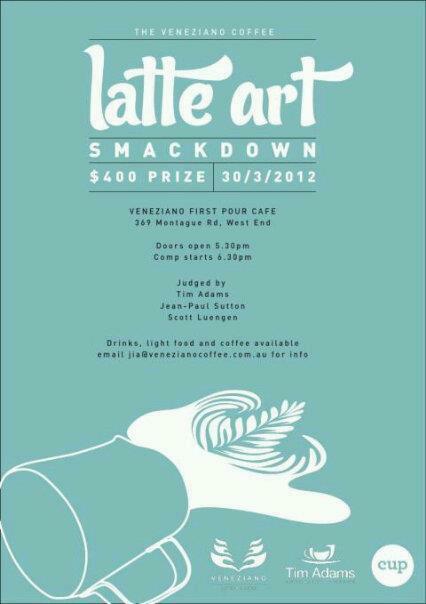 I’m keen to get along to this Latte Art competition at Veneziano. And my keenness is perhaps prodded by this Courier Mail article featuring some work from my friendly local barista, Kane, at Igloo Espresso in Carina. Or rather, good weekend news. Both Bunker Coffee (Milton) and One Drop Specialty Coffee (Fortitude Valley) made my top 10 last year, and both have thrown open their doors for Saturday breakfasts. While Monday is my day off/cafe day, and it appears certain establishments choose to take Mondays off, Saturday is a close second as far as I’m concerned. Read my reviews at the links above. Hit these guys up on Facebook and Twitter for the latest (and some snaps of their menu items). Image: An exterior shot of the Bunker. My day job, well, one day a week at least, is working at Creek Road Presbyterian Church. One of my duties, amongst other things, is making coffee for newcomers. For the last five years this beautiful Rancilio Z11 3-Group has been one of my pride and joys. After I put in a new flowmeter, and did a little bit of maintenance, it’s now up and running and ready for business. So if you’re looking for a church with pretty decent coffee, serving up my very own St. Eutychus blend, come along one Sunday. Have a drink on me. 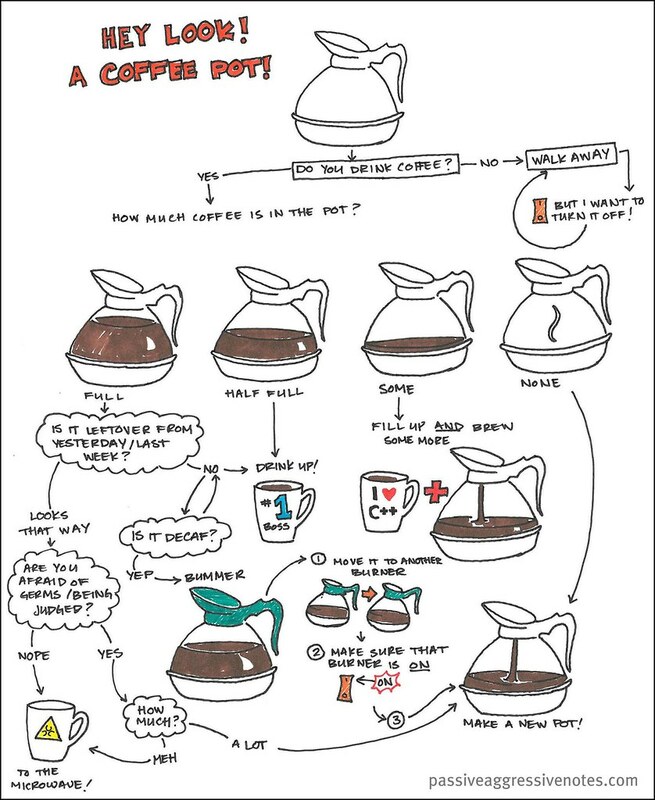 If you are in an office with a shared percolator situation (an SPS) then this flowchart will help you navigate your way past some of the more explosive situations. Ahh Seattle. Home of grunge. Megachurches. Silicon Valley. And the production of high end commercial coffee machines. Three of my favourite commercial machine producers are based there, so I’m pretty jealous of Gizmodo contributor (and former editor) Matt Buchanan, who toured the factories of Slayer, Synesso, and La Marzocco – and put this video together.